One of the most beautiful sections of the 2,650 mile Pacific Crest Trail runs right past Timberline Lodge and along the western flank of Mt. Hood. Alpine meadows, wild and scenic rivers, waterfalls, volcanic evidence, and more wildflowers than you can fit in your camera will tempt you to see what is around the next bend. An amazing 4.4 mile day hike out to big Zigzag Canyon will blow your mind with fantastic views of the volcano, or you can drop all the way down into and out of the canyon to Paradise Park for a 12 mile round trip loop! Mt. 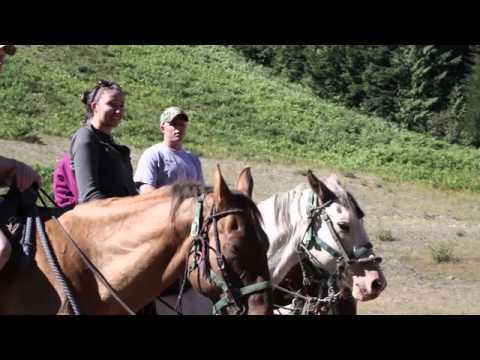 Hood Outfitters can point you in the right direction or head out with you on horseback or hiking boot to explore our local section of the Pacific Crest Trail.